My first official blog post! 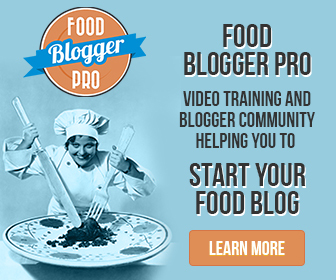 I am so excited to share with you my most delicious recipes and why they work~ my goal is to help YOU to become the best home cook possible. I really, really love eating amazing food. How would it make you feel if your kids (or future kids) said one day, ‘my mom is the best cook I know’ or ‘nothing beats mom’s home cooking’. This is what I strive for. Even now I want my family to actually look forward to one of my meals or treats. Great cooking takes practice, yes. But you’re half way there if you have a good recipe with detailed instructions. I’ve learned so much in striving to achieve my goal. I am zealous to share what I know, and continue to improve and share with you as we learn together. As a child, I will never forget how my dad would boil prunes on the stove to eat. Yes. Boiled prunes. Why?! Perhaps this is one of the great mysteries of the universe. I gave myself a good blister when I was three years old by burning my little arm on the lid of the boiling pot. I was trying to look inside. I never much liked prunes after that. I recently lived in a very old house with a large backyard and a plum tree growing right in the middle. I really didn’t know what to do with the plums or what kind they were. So I just threw them away. (Sad, I know!) Well, I wasn’t interested in prunes. Then the next year I discovered a wonderful use for the Italian Plum tree; Spiced Plum Jam! This year, sadly, I moved away from the little old house into an apartment with no yard. 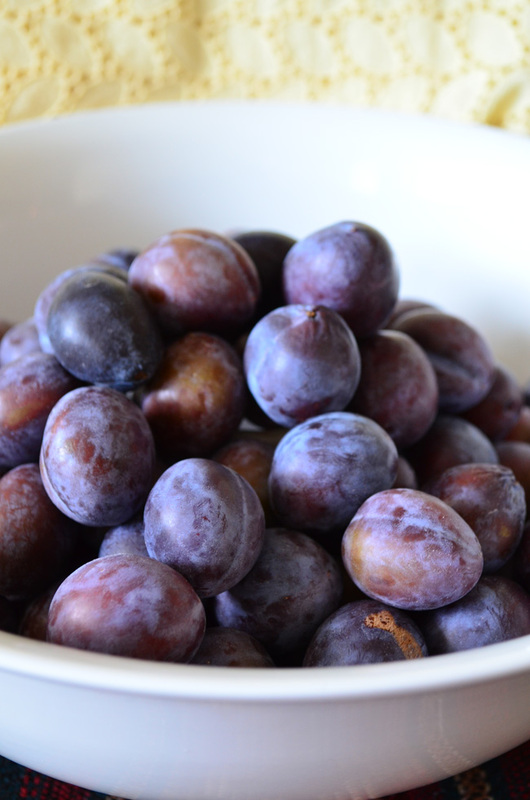 But I was able to harvest a few plums before I left, shown above for one last batch of jam. You can use any kind of plums from the grocery store (or a tree if you know of one) for this small batch of jam, just make sure they’re ripe. You want a nice deep color on the peel; no green at all. And they should give a little when you squeeze them gently. Take a small knife and slice all the way around the plum from pole to pole. Do not remove the peel. Italian plums will be greenish on the inside. Twist open and remove the pit. You should be able to just pluck it out with your fingers. If it’s difficult to remove, the plum(s) may not be ripe enough. 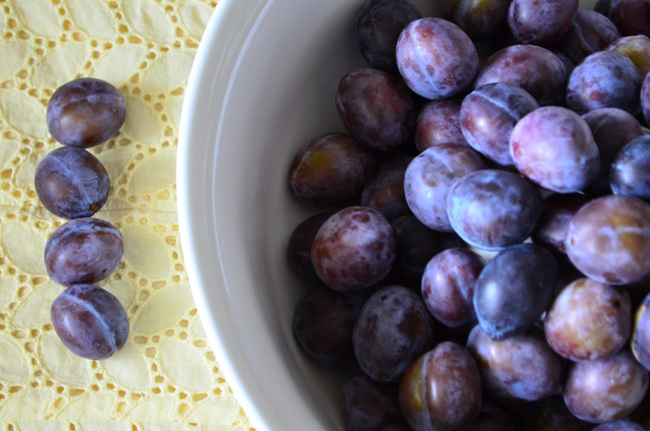 Unripened plums won’t break down when cooking and will remain as green chunks in your jam. Slice the halves into quarters and place them into a large pot or dutch oven. Sprinkle the sugar and spices over and stir it in. Cook on medium-high heat for several minutes, stirring very often. (I would hang out in the kitchen and not try to do any side projects) after a while it will start to look like jam. place a clean spoon in the freezer and let it get nice and cold. Pull the spoon out and drop a bit of jam on it. If the jam sets up and doesn’t drip off in a hurry, it’s done. It is possible to over cook this jam. Ask me how I know. So be careful and check it often, probably after 10 mins or so of boiling. Once your jam sits in a nice little blob on the spoon it’s done cooking! Remove from heat and stir in the final ingredient, vanilla extract. Remember your batch of jam will thicken up a bit when it cools. Now you’re ready to eat, freeze or can your Christmas in a jar! For more info on Stone fruit, and why on earth it’s called that, see Stone fruit. Please let me know how this recipe turns out! If you make some, I would be over the moon with joy to see your photo of my recipe on Instagram or Facebook! Tag me @The_Goldilocks_Kitchen. 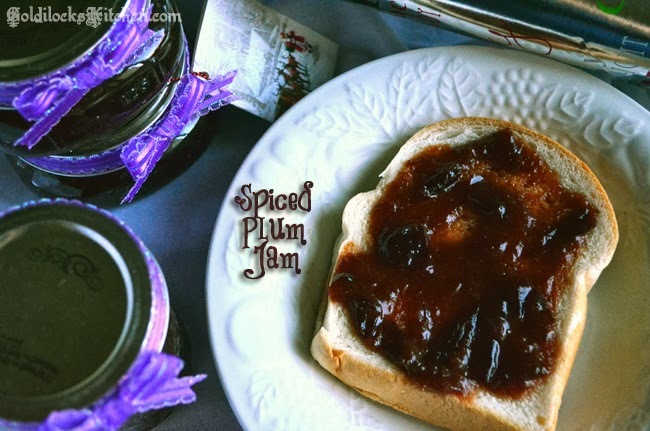 Italian plum recipe: Homemade plum jam cooked with Christmas spices. A jam full of love for a holiday dessert. Place chopped plums in a large pot with non stick coating or enamel coated dutch oven. Add sugar, cinnamon, nutmeg and ginger and lemon juice. Place over medium-high heat and stir very often until the plums have released their juices and flesh has broken down, approx 15-20 mins. Test for doneness with a chilled spoon after 10-12 minutes of continuous boiling. The jam will thicken as it cools. Canning: Fill hot sanitized jars, leaving 1/4 inch head space. Follow the altitude chart for processing times. Hi Cassy! So after seeing your comment I re-read through the recipe and realized I had indeed left that vital info for processing out. I have corrected the recipe and added a headspace of 1/4 inch and a processing chart by altitude so it's more exact to where you might be. Hope that helps!